This is the second of two LPs of Mr. T Experience songs that had no real home on any albums or EPs. 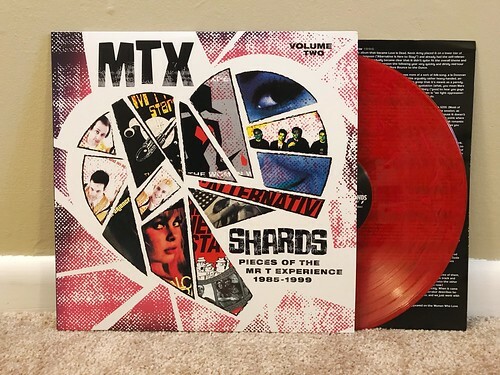 It will also be another instance where I write about this band and aside from this sentence will exclusively refer to them as The Mr. T Experience and not MTX. For reasons I cannot explain, but will attempt to describe, the use of the three letter abbreviation as the defacto band name has always kind of bugged me. When I worked in the music 'biz,' I worked at the company that did the college radio promotion for Yesterday Rules when that album came out. Lookout insisted on using the abbreviation for the promo materials and on the CD itself and how the album was listed in the trade charts. When I asked them why they were burying a band name with almost twenty years of history at that time - who were also, by the way one of my very favorite bands - I was given some sort of non-committal answer about it being hipper and for 'the kids' and to definitely not mention it to Dr. Frank when he came to our office to say hi. I didn't mention it. I've always wondered what would have happened if I did as it was the only thing on my mind the entire time he was in our office. Oh well. Back to the matter at hand, this is a compilation of a lot of random Mr. T Experience songs from a lot of different eras of the bands existence. Some are great and I've always loved like "Hello Kitty Menendez" and "T Shirt Commercial," both from influential compilation albums I had as a youngster. Others are somewhat newer to me like "We Are The Future People Of Tomorrow" and "Crash." These are also from compilations, but I didn't have those when they originally came out, so I don't have the preexisting connection and nostalgia. Lastly, it also includes one of my very favorite songs, "How'd The Date End?" But, it's not the same version as the one that's on the Tapin' Up My Heart 7". This one has an extra part with more lyrics that wasn't on the 7" version, but I just don't like it as much. That 7" version has a certain roughness and energy to it that has always connected with me and I have loved it just the way it is for the last twenty-four years. Part of me thinks that it is kind of humorous that all these years and rereleases later, it is still sort of the hidden gem you can only get on that specific 7", but then the other part of me wonders how many people have never heard the version of the song I like the best. I also wonder why on earth I would possibly care? I still have the 7" and the song, why does it matter what anyone else hears? I do not have answers to quandaries like this. I can say that it is nice to have all of these songs compiled into one nice and easy LP. I will also echo a point I made from the last Shards review and that is I really hope that somewhere along the line, an actual singles compilation with every 7" and EP song gets released. That's what I would most like to see next in the Mr. T Experience reissue project anyway.